Designed for Animals, Loved by Pet Owners! From a trip to the vet to a trip around the world, pet owners want their furry friends to stay safe and feel comfortable. Hard-shell carriers provide protection, but they can cause discomfort over time. Likewise, soft carriers are cozy, but they're not durable. With a Hard Cover Pet Carrier by FRiEQ, you don't have to choose between comfort and safety! Measuring 23x16x15," it's incredibly roomy and great for cats and dogs weighing up to 26lbs. A strong, soft-grip handle makes it easy and comfortable to carry across town or through an airport. With an exterior side pocket, you'll have everything you need. Ventilation slots deliver cooling airflow, while a see-through door allows your pet to see outside! Paired with a padded cushion, pets will enjoy all-day comfort. 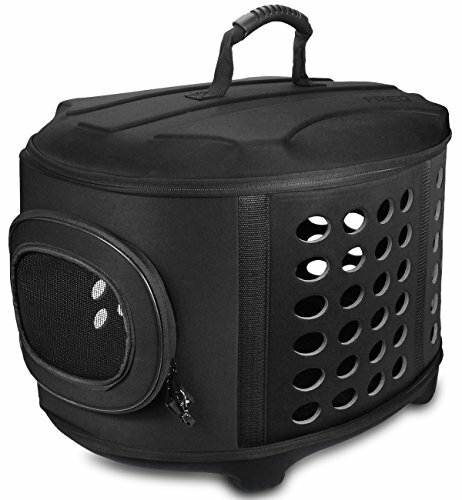 For added convenience, the carrier features a foldable design. In just a matter of seconds, you'll collapse the unit, zipper the top and bottom together and store it under the bed or in a closet. With the right combination of strong, durable materials and soft, cozy fabrics, we're able to offer a carrier that's as protective as it is comfortable! The best part? The top and bottom are both fully waterproof, making it easy to clean. Why Choose Our Pet Carrier? Convenient Pet Carrier: Surprisingly spacious and measuring 23x16x15," our carriers are perfect for animals weighing up to 26lbs! A soft-grip handle makes it easy for you to hold. Foldable Design: Thanks to a soft midsection, our carriers are completely foldable for space-saving storage! Simply collapse the carrier, zip the top and bottom together and slip it under the bed. Finished with a see-through door, pets can see the outside world. Cozy Comfort: Whether you have a cat or a small dog, our carrier will keep them safe and protected! Multiple ventilation slots keep them cool and provide airflow, and our soft padded cushion offers comfort and shock reduction during long or stressful trips. Premium Quality: Designed for practicality, our carrier features a waterproof bottom and top! Whether it's a rainy day, you set the carrier in a puddle or your pet makes an accidental mess, you can easily dry the durable plastic for a fast, hassle-free cleanup. Shop Risk Free: At FRiEQ, we care about the comfort of your four-legged friend just as much as you do! If for any reason you're not completely satisfied with your order, reach out to our customer service team and use our full 30-day satisfaction guarantee. If you have any questions about this product by FRiEQ, contact us by completing and submitting the form below. If you are looking for a specif part number, please include it with your message.